This week we are happy to welcome a new PhD student, Maria Jose Martinez Harms, in to the Lab. Maria Jose is from Santiago, Chile, and she is interested in the implementation of ecosystem service (ES) theory in to conservation practice. Specifically through the development of methodological tools to support decision making process to inform about ES supply, exploring the spatial tradeoffs between ES and biodiversity with the aim of including ES in conservation planning. Maria is concerned about conservation issues in Latin America. In her Honours she worked under the supervision of Professor Rodolfo Gajardo in the University of Chile in the development of a methodological approach to justify the existence of protected areas in the Chilean Western Patagonia because of their potential to supply ecosystem processes and ES (Martinez-Harms & Gajardo 2008). 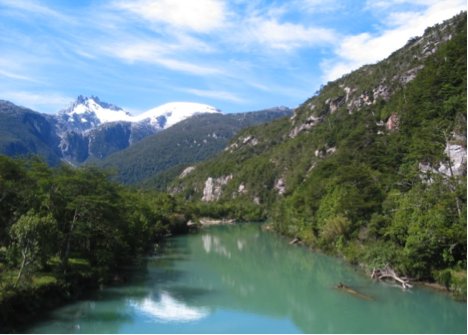 The background of this concern about Patagonian conservation issues is because in Chile more than 80% of the protected surface is located in Western Patagonia (Luebert & Becerra 1998). Nevertheless these areas aren’t ‘hotspots’ of global biodiversity (Myers et al. 2000; Mittermeier et al. 2004) and in the current days the construction of seven big dams and a transmission line is considered by the national government in this region, threatening the conservation of these wild areas (Vince 2010). A Multi-criteria Evaluation was applied using land cover and vegetation maps, scoring each vegetation type according their capacity to supply ES using expert knowledge and available bibliographic information. The main finding of this study was the identification of the most important ecosystem processes and ES these landscapes provide and the assessment of their spatial distribution. Maria did her Master studies in the Centre of Ecosystem Research (CIEco: http://ww2.oikos.unam.mx/CIEco/) in Mexico, under the supervision of Patricia Balvanera, first working with ES provided by Tropical Dry Forests (TDF) (Balvanera et al. 2011). Specifically analysing how their ecological characteristics, the history of the human-TDF interaction, and the results from that interaction determine the type of ES these systems provide. In this study they found that the way TDF are currently being managed and the socio-economic drivers behind such decisions, privilege provisioning ES at the cost of losing, most of the services they provide. In Mexico, Maria also worked for Conservation International as a consultant for a project about conservation of ES and biodiversity at the watershed scale in Chiapas, Mexico (http://www.conservation.org/global/mexico/convocatorias/Documents/Anexo-7-Martinez-Harms-Quijas_Monitoreo-y-mapeo-SE.pdf). The aim of this study was the development of the knowledge for the appraisal of ecosystem services and their interactions with land uses among key stakeholders at the watershed level. The main results of the study was the identification of the most studied ES and the existent gaps of information in the region, identifying the main land use change forces affecting ES and biodiversity, identifying the main stakeholders and their level of capacity to be involved in these subjects to finally propose a method to map and monitor ES and BD which was defunded by Conservation International between the stakeholders involved. 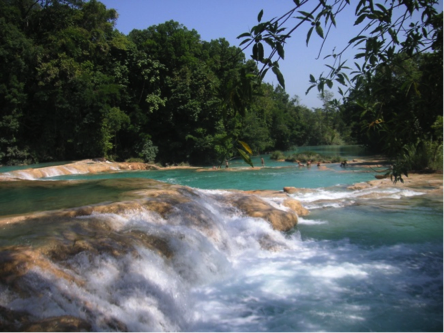 Figure 2: Agua Azul Waterfalls in Chiapas (in the study area of the project). For her Master studies Maria worked in mapping ES in a Mexican watershed (Martinez-Harms et al. In Review) exploring whether combining service field quantification and modelling with several data sources (combined field models) improved predictive power of ES maps with respect to those based purely on land cover data (LUC models). They apply this approach to four services provided by vegetation (forage, timber, firewood and aboveground carbon storage). Resulting combined field models explained a large amount of the observed variance explained mainly by land cover and remote sense variables. Mapping ES combining field data along with cartographic information could improve modelled estimates as compared to relying strictly on land cover data. Such combination of approaches is needed to enhance our ability to inform decision-making. Figure 3: View of the lower part of the Mexican watershed (Chamela-Cuixmala Biosphere Reserve). Prior to starting her PhD Maria was in Chile working with Patricia Balvanera in performing a review of the different approaches used to map ES, with a special focus on those that use socio-ecological data (Martinez-Harms & Balvanera 2012). Regulating ES were the most commonly mapped followed by provisioning, cultural and supporting ES. 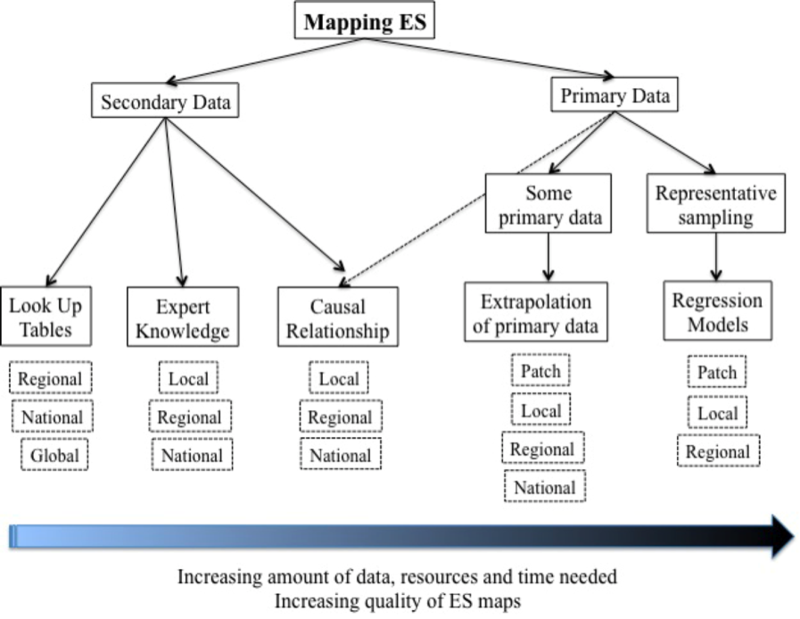 Secondary (readily available) data has been used more frequently than primary data to map ES. Biophysical data (land cover variables) and mixed sources (databases like global statistics) were the most commonly employed ones. Most studies have been performed at the regional or at the national scale. The most commonly used method to model services was the development of models based on well-known causal relationships between environmental variables (see figure 1). The synthesis revealed that the majority of studies are based on secondary data, applied at broad scales, without validation techniques. Figure 4: Decision tree highlighting the methods used in the review developed by Martinez-Hams and Balvanera (2012) according to data availability. Currently Maria is starting her PhD at the lab working on conservation planning for ES in the national system of protected areas of Chile. The aim of the proposed research is to develop a conceptual and methodological framework to map ES at multiple scales, delineating guidelines for decision makers to incorporate biodiversity and ES in to conservation planning. In this study Maria and her co-authors will identify areas that provide the highest ecosystem services supply that will be compared to known areas with the highest levels of biodiversity and assess the tradeoffs between these conservation goals. They will determine where conservation can benefit both ES and biodiversity, to propose the most suitable priority actions where both goals can be achieved considering the drivers of loss that are currently affecting them. Luebert, F. & Becerra, P. (1998). Representatividad vegetacional del sistema nacional de áreas silvestres protegidas del estado (SNASPE) en Chile. Ambiente y Desarrollo 14(2): 62-69. Martinez-Harms, M.J., S. Quijas, A. Merenlender & P. Balvanera. (In Review). Mapping Ecosystem Services: from the Local to the Watershed Scale. Journal of Applied Ecology. Mittermeier, R.A., Robles Gil, P., Hoffmann, M., Pilgrim, J., Brooks, T., Mittermeier, C.G., Lamoreux, J. & da Fonseca, G.A. (2004) Hotspots Revisited: Earth’s Biologically Richest and Most Endangered Terrestrial Ecoregions. Ciudad de Mexico, Mexico: CEMEX. Vince, G. (2010). “Dams for Patagonia.” Science 329(5990): 382-385. DOI:10.1126/science.329.5990.382.